Image caption Guto Bebb said the electorate should choose between the status quo and the deal the prime minster offers"
Former Conservative minister Guto Bebb has joined calls for another Brexit referendum. The Aberconwy MP said the electorate should "decide if they are happy with the deal the prime minster secures". He resigned as minister for defence procurement to vote against the government on amendments it accepted to its Customs Bill in July. 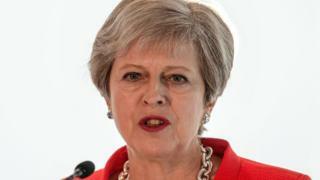 Theresa May has said she will not "give in" to those calling for another referendum on the withdrawal agreement. The People's Vote, a cross-party group including some MPs, is calling for a public vote on the final Brexit deal. Conservative MPs Anna Soubry, Sarah Wollaston, Justine Greening and Philip Lee have already said they support a so-called people's vote. Speaking on BBC Radio 4's Today programme, Mr Bebb said the choice put to people should be "between the status quo and the deal the prime minster offers to the people of this country". "We're now in a situation that we actually do know what Leave looks like and we clearly know what Remain looks like," he added. "It's nothing other than democratic to allow people to look at the facts of the matter, to look at what has been secured by the government and to say 'do we accept that or not.'" Image caption The prime minister has said a second referendum would be "a gross betrayal of our democracy"
He said there was a "growing realisation across the parliamentary party that there is no majority in the house for any form of agreement." He described the Chequers deal as "common market minus, minus, minus", adding: "Even the people who voted Leave on the basis that they wanted to be in a common market, not in a political union, are now being offered something that is far short of the common market." "The people of this country have a right to express a view on any agreement - and no agreement if it is no agreement - before we actually pull the plug." Guto Bebb resigned from his position as a defence minister in the UK Government in July after concessions made to Brexiteers. Days after Theresa May agreed her Brexit plans with the UK Cabinet - the so-called Chequers agreement - concessions were made which Bebb though would undermine that deal. He joked at the time that it was rare for a minister to stand down in order to support the government's position. Back then he gave Theresa May his full support following Boris Johnson's resignation and growing turmoil within the Conservative ranks. Now he is setting himself firmly against the Prime Minister. Last week she ruled out another referendum, insisting it would be a "gross betrayal of our democracy and... trust". If other Conservative MPs join Bebb and the others calling for another referendum it will deepen the schism which already exists within the party. Bebb joined hundreds of people in a People's Vote rally in Cardiff Bay on Saturday, which included speeches from Tory, Labour, Plaid Cymru and Liberal Democrats politicians. Writing in the Sunday Telegraph last week, Mrs May said: "In the summer of 2016, millions came out to have their say. "In many cases for the first time in decades, they trusted that their vote would count; that after years of feeling ignored by politics, their voices would be heard. "To ask the question all over again would be a gross betrayal of our democracy - and a betrayal of that trust."